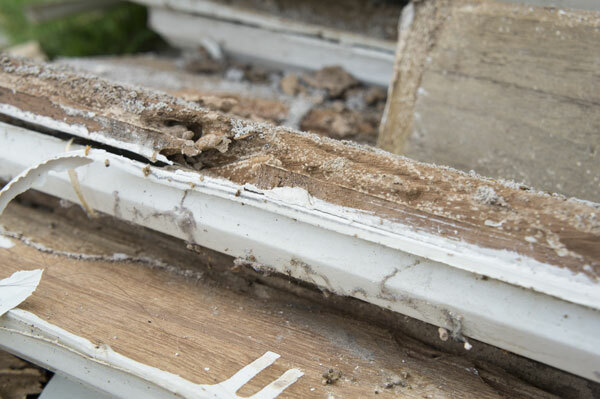 Termites cause billions of dollars in property damage throughout the U.S. every year, and homes can be reach the point of being structurally unsound without your even being aware of an infestation. All termites consume cellulose-based plant materials, and every home has numerous sources, which can provide food for termites. Give The Bug Dude a call for a suspected termite infestation, our professionals will provide the pest control in Fort Worth that you need. Termites feed on dead plants and trees as well as dead parts of living trees, and including wood and wood in the soil. A termite’s feeding habits are capable of causing significant damage to property. Subterranean termites typically construct their nests in the soil. When a colony has matured, termites in a home will swarm, and the winged insects will be attracted to windows and doors. Winged termites are most active in the spring. However, they are active year round, working 24 hours a day. If you see termites in or near your home, contact The Bug Dude for pest control in Fort Worth. Professional pest control in Fort Worth is required for a termite infestation. However, you can take steps to make your home less inviting. Eliminating moisture and food sources will go a long way in deterring termites from your property. Repair water leaks, both indoors and outside of the home. Moisture creates an ideal environment for termites, and repairing leaks and other causes of moisture will deter termites. Divert water from the foundation by ensuring gutters are functional and in good shape, and free of clogging debris. Use downspout diverters to carry water safely away from your home or have them plumbed to empty into the municipal sewer system. Remove excessive plant cover and wood mulch. Foundation plants should be at least 12 inches from the foundation, and trimmed to ensure they don’t touch the walls. Contact a roofer for repair of leaky roofs. Keep all ventilation pipes free of debris and open. In addition, covering vent pipes with a screen will prevent insects from entering your home through the pipe. Seal entry points around water and utility lines or pipes to keep pests like termites out of your home, in addition it may assist you on your energy costs. Termites need moisture to survive, and will die if exposed to sunlight or open air for more than a few minutes. Their tunnels protect them from the elements. High moisture areas like basements and crawl spaces are very attractive to termites and can serve as starting points for an infestation. Once inside, termites can infest any part of your home. When you contact The Bug Dude for pest control in Fort Worth, we will provide an examination of your home and provide suggestions for deterring termites and other pests. Store firewood, and lumber as far from your home as possible. Twenty feet is the minimum you should consider. Termites can travel as far as 130 feet from the colony, and once they detect a food source, they leave a chemical trail for others to follow. Piles of brush, limbs, sticks and other woody debris are attractive to termites and other pests. Cleaning up around your home goes a long way in termite prevention. In addition, have stumps removed to deter termites. Once your property is free of the cellulose material termites love, contact The Bug Dude for pest control in Fort Worth to rid your property of existing termites. Routinely inspect decks and wooden fences for termite damage. Remember, termites are attracted to dead or rotting wood. A deck or fence in good repair is less likely to attract termites. An even better solution is to utilize synthetic materials that won’t rot. Mud tubes on exterior walls, wooden beams, on the foundation or in crawl spaces. The presence of discarded wings from swarming insects indicated an infestation. Buckling paint or small holes in the wood may indicate the presence of termites. Swarming termites inside of your home are evidence they have infested the structure. Although termites may only be visible during the spring and summer, termites are active even when they are not visible. If you see termites inside your home, remember it means damage may already be underway. Contact our knowledgeable professionals for pest control in Fort Worth. Any home in the southern U.S. is vulnerable to a termite infestation, and should be routinely inspected by a professional for termites. In the South, termites cause millions of dollars in damage to homes each year. Even if your home has a concrete block foundation or basement, termites can enter the home. No home is immune, but The Bug Dude can provide your best defense with professional pest control in Fort Worth. Termites typically emerge during on warm days after rain. Spotting termites outdoors near tree stumps, brush piles or other outdoor locations, is not an indication that your home has an infestation, but does mean they are present on the outside. Subterranean termites nest in the ground and build mud tubes that connect the moist nest to the food source. The presence of mud tubes may indicate an active termite infestation, although a lack of the tubes does not necessarily mean the structure is termite free. Termites can access the wooden structure of your home through tiny cracks or voids in the foundation wall, beneath outside stucco or siding, through earth-filled porches, steps, and other means. Breaking the tubes open will allow you to determine if an active termite infestation is present. If termites are infesting your home, give The Bug Dude a call. We will inspect your home, identify the species of termite and provide pest control in Fort Worth to rid your home of termites. Once termites are spotted damage has often already occurred. Immediate action with professional pest control in Fort Worth is required to stop the damage, termites are inflicting to your home. The professional results you need are just a phone call away, so call today.